After my years of puzzlement versus Leonardo, I have the greatest sympathy for the early generations of dinosaur paleontologists, being confronted with the often-scanty remains of beasts that had never been seen by anyone. We've already touched on Marsh dealing with Atlantosaurus and Cope dealing with Monoclonius recurvicornis. Ankylosaurians were no exception to the confusion. If a dinosaur skeleton is like a puzzle, a partial ankylosaur skeleton is like getting 300 pieces of a 2,000 piece puzzle, with the only guide being a hand-drawn copy of the box cover drawn by a right-handed person using their left hand, who is also in denial about the state of their vision. The puzzle, of course, is a stand of birch trees in a Great Lakes winter, in black and white. Small wonder that ankylosaurs spent most of the 20th century in the guise of magnified grouchy horned toads, covered in a pavement of armor laid out with enough regularity to satisfy the most tyrannical of 1950s suburb planners. Taylors Falls in the St. Croix Valley of eastern Minnesota presents an unusual geologic snapshot along a Cambrian coast. Within the south part of Interstate State Park, for an investment of a little more than a mile of walking round-trip, you can go from ancient basaltic islands, to the lithified rubble surrounding them, to the flanking sandy beach. Geologists love to try to paint verbal pictures of vanished settings, but rarely do the modern outcrops cooperate so nicely. Thank you to the park staff for suggesting an interpretative walk! Other photos of the same slab are on the Internet, but my photos may be the only ones without the glass, so they've got that going for them. The scale is important, because for some reason, when taken without it, the fossils look to be about the size of dates, when they are actually more like the size of the first joint of a finger. The fossils represent the body, or "theca". These are visually unusual fossils, looking something like a pine cone, or a pineapple, or a cluster of berries, or a grenade. A close look shows that their surfaces are covered by shared circular arrangements of six (usually) wedge shapes, kind of like Trivial Pursuit pies that share wedges with other pies. If you're familiar with the kinds of words that are frequently used in scientific names, you may have already guessed that we're dealing with an echinoderm. 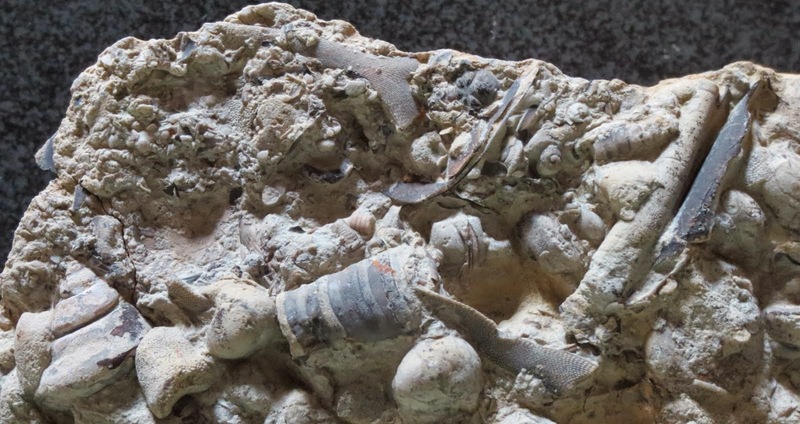 If you guessed "paracrinoid", congratulations, either you are really good with echinoderms or you already know something about Oklahoma's fossils. * A paracrinoid is one of the numerous varieties of stalked echinoderms that flourished for a relatively brief span of time during the Paleozoic and then went extinct. The name suggests affinities with crinoids, but it should be noted that sometimes they are classified more distantly, with relatives to blastoids ("sea buds") or as their own group distinct from either crinoids or blastoids. Like those two groups, a complete paracrinoid would have also featured a stalk attaching it to the seafloor. 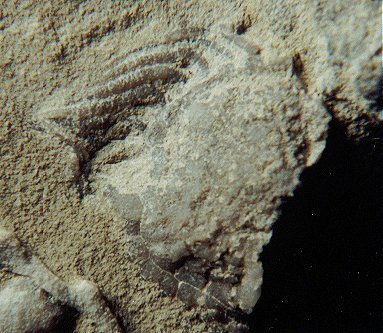 Presumably Oklahomacystis would have had a fairly simple feeding apparatus compared to crinoids, like the similar paracrinoids Amygdalocystites or Comarocystites (which looks quite a bit different because its thecal plates are strongly concave, giving it that "puckered hexagon" look that was such a craze in the Ordovician). Oklahomacystis had recumbent arms which are part of the thecal structure; as the species name "tribrachiatus" indicates, there are three of these (tri + brachi, meaning arm, which of course we know from Brachiosaurus, the "arm lizard". Snuck in a dinosaur!). Like the other two genera mentioned above, Oklahomacystis's filter feeding apparatus would have consisted of pinnules attached to the arms. If you'd like more technical information on paracrinoids, there's a monograph on the subject available here (no. 288; it just happens to name Oklahomacystis as well). I'll be at an event for Interstate State Park next weekend, so expect some Cambrian in the next post. After that, I'll try to do something dinosaurian; otherwise they'll take away my card!